The 80s saw the death of screw-in light sets as plastic capped push-in lights started to flood the market. Push-in lamps are cheaper to produce as plastic is cheaper than brass and the process of fitting the cap is much simpler. With a screw-in lamp the cap must be cemented to the glass bulb and the lead wires trimmed to the cap. For a push-in lamp, the cap is fed over the lead wires and glued to the lamp. The lead wires are then bent over onto the cap, job done. 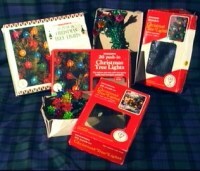 Here is a typical example of a set of lights from the 80s. Most (if not all) tree lights where coloured and had some sort of shade (usually similar to these). 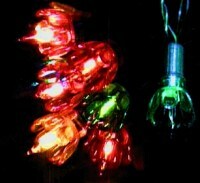 It is interesting to note that the price of Christmas lights has hardly changed. 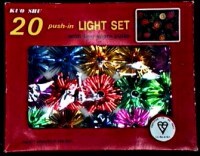 A set of these lights cost �99 (1985ish), where as a set of budget lights cost �99 in 1998. Each shade has several 'petals' which act as lenses, concentrating the light. The lamps are push-in with axial filaments and with time, the lamp colours tended to fade (especially blue and pink). These sets where produced for many years and where available in sets of 20 or 40. Above are a few examples of the boxes that these sets where sold in. 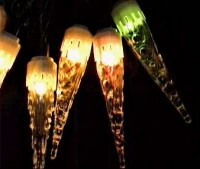 No Christmas light web site could not be complete without the traditional 'Icicle Lights"! The shades are made from plastic and look quite realistic (especially if you can get all the icicles to hang downwards). Be warned - standing underneath these lights can be hazardous as a slight vibration could send a loose shade hurtling towards you� ouch! 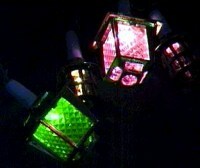 These are one of my favorite light sets and have been produced by many different manufacturers and in many variations. I think the design originated from GE who produced a range of lamps for US consumers called 'Melted Ice'. These lamps where similar to the Pom-pom lights in that the lamps had a rough 'crushed ice' finish and where intended for use in decorative light strings. 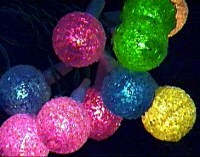 The Pom-pom lights have push-in lamps surrounded by coloured plastic spheres. Each sphere is covered with tiny fragments of plastic which give the shades an icy appearance. 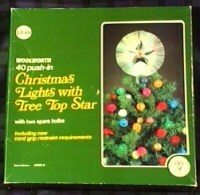 This set is typical of the "tree top star" sets that where being sold in the 80s. 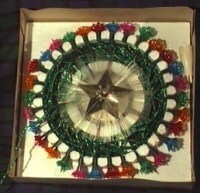 The plastic star has 10 light on it, 9 of which are behind the circular brush and the tenth is in the centre of the star. The remaining 30 lamps extend from the star in the from of a standard light set. 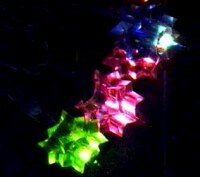 Another very popular style of christmas light from the 80s. 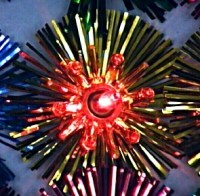 Many manufacturers produced some variation on these lights. This is one of the last few set to be available with screw-in lamps and comprises twenty large and small lanterns. The large lanterns are square with four coloured prismatic panels and the small ones are round with a cylindrical coloured lens. Several companies have tried to produce small lantern shades but, unlike Noma, have not managed to get the size or proportions right. The small lanterns are now available as a push-in set called "Victorian Lanterns" but have been slightly redesigned to improve ventilation of the lamp. The early screw-in lanterns sometimes overheated on failure of the lamp, resulting a deformed coloured lens and lampholder (sometimes with the lamp stuck in it). Fortunately this problem seems to be fixed in the newer sets.